Haine Middle School fifth-grade students in John Schmidt’s Science Purpose class, along with members of the Haine PTO Humanitarian Committee, recently worked together to clean up the courtyard, put together a compost bin, and plant milkweed seeds at the school. Shown from left are Erin McMillan and Mia Stohon. Students in the Seneca Valley aviation course visited the Condor Aero Club at the Zelienople Municipal Airport on Oct. 21 to work with 10 pilots with commercial, military, and recreational experience. Students were also able to preflight planes and put their instrument knowledge to use. At Seneca Valley, each student is given time to evaluate and practice simulated flight through the use of computer programs in the computer lab. Chase Rowe, head coach of the La Roche College baseball team, was named the Chuck Tanner Collegiate Coach of the Year in November. The award recognizes those who represent dedication to sport, excellence and integrity. In 2006 at the age of 23, Rowe took over the La Roche College baseball program, making him one of the youngest head coaches in the National College Athletic Association (NCAA). 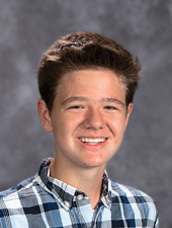 Jacob Geil, a freshman from Seneca Valley Intermediate High School, was awarded high honors for being among the highest-scoring participants in the 2015 International Talent Search. This award recognizes excellence in mathematical, verbal and spatial abilities by the Johns Hopkins University Center for Talented Youth (CTY). Geil will receive a one-course scholarship at Grove City College in recognition of his outstanding performance. North Hills High School’s Music Department has been named a Program of Distinction by the Middle States Association of Colleges and Schools Commission on Elementary and Secondary Schools, one of the nation’s top education accrediting organizations. The music department is one of only six music programs in the nation to be honored with this notable accolade. Through its new Team Up for Success program, Shaler Area High School student athletes mentor and tutor students in primary school classrooms. Team Up for Success kicked off in October at Jeffery Primary School with about 20 high school student athletes working with students in kindergarten through third grade. Following the program’s initial success, there are plans to expand the program into other primary schools. A team of O’Hara Elementary School fourth-grade students were named the winners of the 2015 Fox Chapel Area School District Battle of the Books Tournament. The tournament is the culmination of eight weeks of reading and studying books from a selected book list. The winning team members were Madelyn Jones, Whitney Jones, Clara Kelley, Kate Leland, and Megan Mulhern. Their team name was the Rainbow Gummy Bears. Western Pennsylvania Montessori School (WPMS) in Allison Park celebrated its 50th anniversary by hosting a gala at Wildwood Country Club and by holding an open house in October. More than 215 people attended the gala, where Lisa Sylvester, WPMS parent and local WPXI news anchor, served as mistress of ceremonies. BHS and HVHS have entered into a strategic relationship to provide select physician subspecialty services. The PA Brain & Spine Institute will be the first subspecialty practice of the BHS/HVHS Multispecialty Group, Inc. and will provide expert surgical care to patients with complex neurosurgical needs under the leadership of Dr. Michael Horowitz and Dr. Richard Spiro. Amulya Garimella, a Dorseyville Middle School seventh-grader, has been named a third place national winner in the 2015 Discovery Education 3M Young Scientist Challenge. Amulya received a $1,000 prize and a student adventure trip. Finalists were chosen for using scientific thinking and imagination to create a solution to everyday problems that will improve lives and strengthen communities around the globe. St. Ursula robotics students in grades 5-8 are working to prepare for two FIRST LEGO league scrimmages in November and the grand championship in January. This year, the theme is Trash Trek Challenge, and students are meeting two days a week to construct the field and to program the robots to perform very specific tasks. Coaches include Charlotte Lehmeier, Jason Mizorski and Catherine Duffy. A total of 23 Fox Chapel Area High School students were inducted into the Spanish National Honor Society on October 12, based on their achievements in Spanish language classes. They are seniors Kelly Arel (president), Jessica Berg, Lydia Beyer (secretary), Francesca Cano-Czagany, Matthew Friday, Benjamin Friedland, Kota Furuhata, John Gurklis, Mary Humphrey, Melissa Jerpe, Kathleen Kiszka, Julia Lynch, Nathan Matisko, Ryan Morrissey (treasurer), Amanda Puthenpurayil, Siddharth Rajupet, Jesuloluwa Shodipo, Brad Vayonis, Michele Wolff, Emilie Yousem, and Megan Zonker (vice-president), and juniors Nadia Islam and Alexander Smolar. Returning members are seniors Elena Berg and Cameron Walter. Approximately 270 students from 18 schools from Pennsylvania and Ohio competed at the event. Shaler Area School District is proud to welcome Sean Aiken as the new Shaler Area superintendent of schools. He has more than 20 years of experience in education, and has served as assistant superintendent at West Allegheny, as principal of Quaker Valley Middle School, and as assistant principal of Shaler Area Middle School. He began his career in education as a special education teacher. Rose Marie Manley, CTP, the treasurer of Allegheny Technologies Incorporated (ATI), recently joined the La Roche College board of trustees. Her career began in the accounting department of Rockwell International Corporation, and she later moved to the Treasury Department. She joined ATI as a senior cash manager in 1997. The Allegheny Intermediate Unit’s Center for Creativity Teachers recently recognized Carol Nelson, Jen Schrecengost and Heather Herger with an award for innovative use of technology in district classes. Nelson, a McIntyre Elementary School first-grade teacher, and Schrecengost and Herger, who are both elementary literacy coaches, are leading the implementation of a new sixth-grade English literacy arts curriculum. Through the use of the curricular resource, StudySync, and the incorporation of classroom iPad carts, students have access to a digital library and multimedia assignments that include reading, writing, peer review and discussion. Eight Fox Chapel Area High School students were recently selected to perform with the 2015 Pennsylvania Music Educators Association (PMEA) District 1 Honors Band. They are senior Olivia Van Dyke; juniors Rohan Chalasani and Philip Swigon; sophomores Benjamin Franks-Meinert, Elizabeth Mountz and Zachary Zytnick; and freshmen Hannah Kim and Glenna Van Dyke. North Hills High School’s Students Against Destructive Decisions (SADD) club has been named Pennsylvania SADD Chapter of the Year by the PA SADD/DUI Association. The North Hills chapter topped more than 200 other chapters across the commonwealth to be selected for the award. The Community Health Clinic of Butler County is the only community-based free health clinic for the uninsured in southwestern Pennsylvania, and is entirely dependent on community financial support. The Clinic’s third annual Signature Sensations event, held at Butler Country Club in November, raised $40,000 to support the clinic’s work. On Friday, Nov. 13, high school students from Hampton, Pine-Richland and Bethel Park visited La Roche College for the first Junior Achievement (JA) College Day in western Pennsylvania. JA College Day is a one-day event for middle and high school students to tour a college, meet faculty and staff, and participate in JA programming. Students had the opportunity to explore La Roche, learn more about career planning, tour campus and enjoy lunch in the Cantellops Dining Hall.